The following is an account of an environmental observation flight which Associate Member Steve McCurrach of Airserv, embarked upon for Bateleurs (flying for the environment in S.A.) This is Steve providing feedback in his own words, 23 February 2012. "I have what is hopefully some interesting reading for you here and possibly even a matter to take up with ‘your’ building industry. Possibly presented to members on a “best practices” recommendation, or even to simply create awareness through Ernest’s newsletters. The flight for which I was looking at your WX station and about to embark on this morning has its origins where The Bateleurs (flying for the environment in S.A. – see; www.bateleurs.co.za) received and have approved an application for a survey flight, from one Dr.David Maritz of the KZN Dept of Environmental Affairs. Very basically this flight requires the following of the 5 local/north coast river courses, Umdloti, Tongaat, Umvoti, etc. capturing photographic evidence and Geo locating, for purpose of prosecuting offenders engaged in the business of improper and illegal sand mining in these rivers. Both authorities and journalists have been chased off illegal sites and even received “stay away” threats, but no problem, as The Bateleurs are here. That sounds like a radio commercial jingle, but its not and the bottom line really is no problem, because with the aerial perspective, we can cover the entire zone in one flight, identifying, isolating, inspecting and capturing images of the offenders, something which would take ground personnel weeks to do, if they managed at all to accomplish the same results. Apparently the local municipalities (and one fella in particular at Ilembe) are issuing ‘sand winning’ permits willy nilly and mostly on a nepotism driven basis, rather than issuing to professionals in this industry. The net result is that the river courses are being raped, with the stable/hard banks being cut into and resulting in extremely damaging consequences when annual flooding occurs. 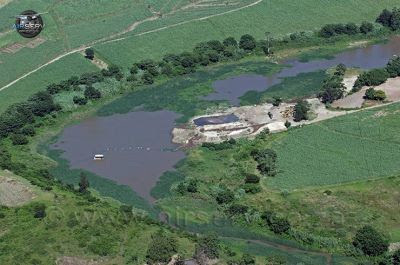 Sand winning as its referred to should amount to only the ‘skimming’ off the “Umngeni” sand from the top of the sand bars, without disrupting the water course and with this flood plain material simply being re-deposited by the river during the next rainy season i.e. all done on an environmentally considerate and sustainable basis. What is ludicrous is that it is these very same departments, who on the one hand allow this uncontrolled sand winning to go ahead and yet on the other hand they are the same folk supposedly upholding the ideals of environmentalism when you or I are obliged to undertake an EIA. These days if one ventures to construct, develop, dig, dump or dam any part of the land, then this must be preceded by a time consuming, frustrating and expensive EIA. Isn’t it therefore painfully ironic that this sand winning flies in the face of anything that an EIA stands for and yet with both elements under the custodianship of the same municipal departments. DEA have taken up the chase and for me it is heart-warming to see that Province will bring to book and discipline any errant local municipalities when those municipalities cross the line of good housekeeping in the environmental sphere. DEA really need our support in such endeavours and where our members could possibly contribute in a meaningful way. Let’s say perhaps In the same way Woolworths will uphold best practice policies, by not selling you genetically modified foods and they will grill and qualify their suppliers rigorously. The building industry should have the gravitas to do likewise. How about the building industry stands firm and only takes delivery from accredited sand winning operators, who in turn are inspected and audited on proper (non destructive) mining practices. This would do the buyer/builder no harm, as the sand supply industry is sufficiently competitive that prices would not be affected, but the hoods in the sand winning game would soon be frozen out. As a builder, would you not like to look back upon your completed project, placing a “green stamp of approval” on it, knowing that no water course or river was trashed in the course of building this development. I certainly would." All that was left was his boots!